This is a Pawn chess piece that modified in beautiful and elegant looks. A Pawn chess pieces has polished in marble motive with blue mix color. So different and beautiful with charming looks. 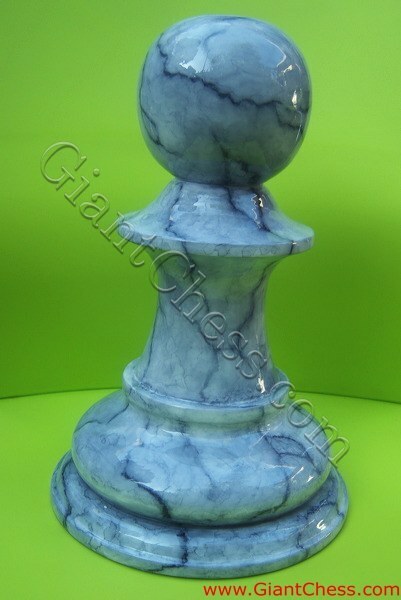 Wooden chess pieces polished in marble with combination color of blue and white. The chess piece above has polished well in order to looks like a marble chess. But it made from best quality of Teak wood. Wooden chess piece is excellent for use outdoors and can be left in the sunshine, rain or snow without being damaged. It can actually become a permanent fixture on your porch or patio as house decoration. The chess piece has prepared for outdoor use, so you can left it outdoor for months. Made from best wood and polished in good paint, the marble chess pieces is high recommended for house decoration.